Thousands of mourners have been attending funerals across India for some of the security force personnel killed by a suicide bomber in Indian-administered Kashmir on Thursday. At least 40 paramilitary police died in the attack near Srinagar. 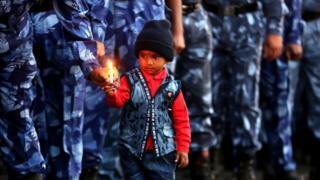 The militant group Jaish-e-Mohammad said it carried out the attack. 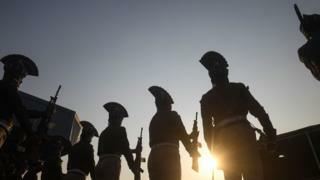 India has imposed a swathe of economic measures on Pakistan after the attack, including revoking Most Favoured Nation trading status and raising customs duty to 200%. How far might India go? 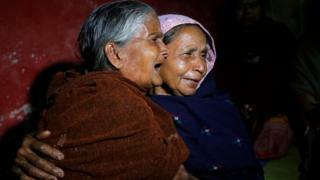 Although Jaish-e-Mohammad is based in Pakistan, Islamabad has denied any role in the attack. 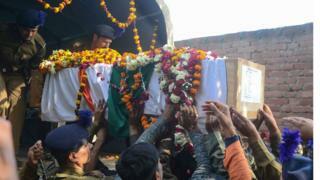 Relatives of Central Reserve Police Force (CRPF) soldier Sukhjinder Singh mourn as his coffin is taken to his cremation ceremony at the village of Gandiwind in the Tarn Taran district of India's Punjab state. 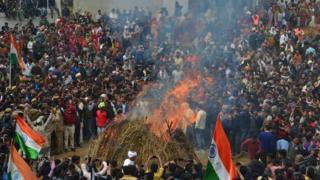 The cremation is held for CRPF trooper Kaushal Kumar Rawat in Agra. 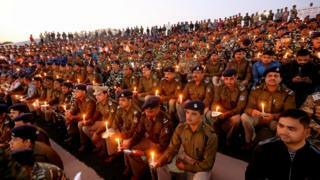 CRPF and Rapid Action Force soldiers hold candles in tribute to dead colleagues during a vigil in Bhopal. CRPF officers bow in tribute (top) to colleague Bablu Santra in Howrah, West Bengal, as his mother (above right) mourns him in the village of Bauria. 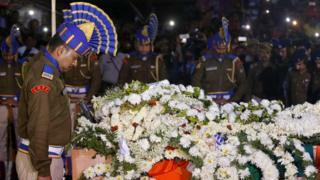 CRPF personnel stand guard over the coffins of Sudip Biswas and Bablu Santra at Kolkata airport. 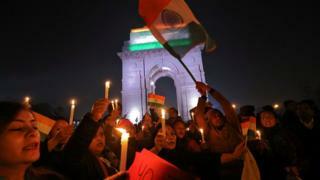 People attend a vigil in front of the India Gate war memorial in Delhi. 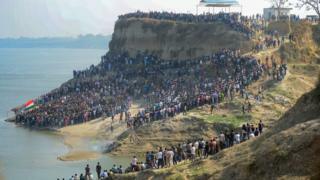 The coffin of Mahesh Kumar Meena arrives near Allahabad (top) and hundreds gather on the bank of the Ganges for his funeral procession. 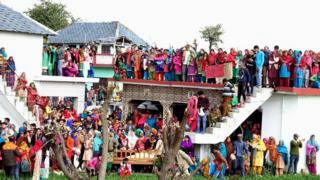 Dozens more gather for the return of the body of CRPF member Tilak Raj at his home in the village of Dhewa Jandroh, 90km (55 miles) from Dharamsala. 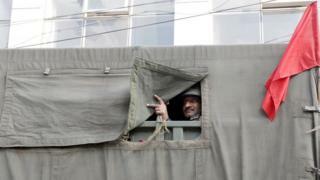 Tension remains high in Jammu, Indian-administered Kashmir, amid a curfew.